Middle Blackhall is outstandingly attractive, secluded yet easily accessible, being only half an hour's drive from Aberdeen Airport. 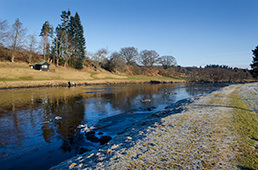 The beat, which accommodates three rods, extends to approximately 1.6 miles of single bank fishing and is 2 miles upstream from the delightful town of Banchory. A variety of pools, runs and glides provide excellent holding pools and lies in varying depths of water. This beat is directly opposite the famous Cairnton Water, on which Mr Arthur Wood pioneered the use of the greased line in the 1930s. The riverbanks abound with wild flowers in early summer. Cowslips, wild geraniums and lupins are among countless species which add colour to the magnificent scenery. Banks are cut to a standard seldom encountered on other beats. The beat extends from a concrete marker on the south bank above Douglas Pool, downstream to the Mill Rush Pool below Invercannie Pool. Although many of the pools can be fished from the bank, fishermen are advised to equip themselves with chest waders. There is a full- time ghillie, Terry Paton, who is responsible for the beat. He also runs the opposite bank of Cairnton but his services are limited to advice only from mid-July to end-August. There is a substantial timber fishing hut well sited above the Canary Pool. The hut is comfortably equipped and has a wood burning stove.